For sale in my area heads up. I'm not selling it and know nothing about it. Dont see too many of those rosewood boards around. My st80 is from the same year but has worked hard since the day I bought it brand new in 1980. Love that guitar! Sorry but I'd need plenty more pictures before I pulled the trigger on that. 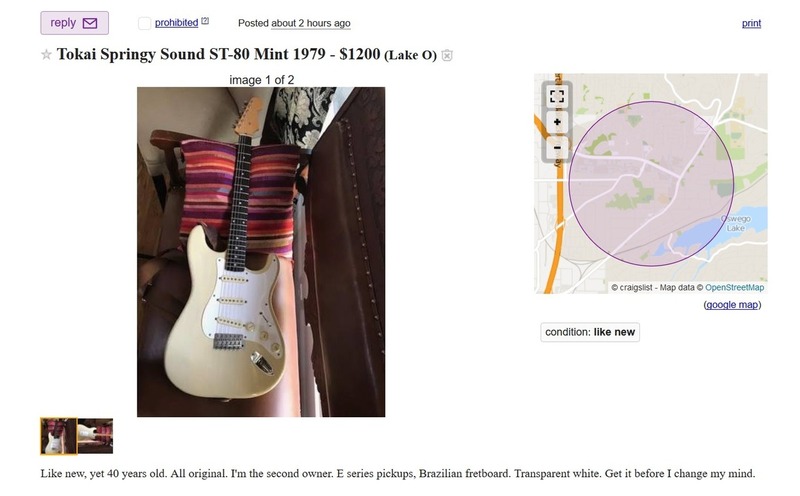 For a rare rosewood board and finish color, that price is awfully low for an ST80 in that kind of condition. I've thought about going and taking a look at it several times, but you know how that is. Suddenly I'd have another Strat! Regardless, there's no decal on the headstock from what I can see. Under the hood for any identifying stamps on the heel, label/fretboard stamp. Same thing with the body and electronics. There's always the uninformed out there, which often works to our advantage. If this one checks out, $1200 is a great price. Only if you're ignorant and judge groups of people by one individual among them.